What does it mean to be a “good parent”? How can you teach your children to be brave, strong, healthy people when you don’t always feel that way yourself? 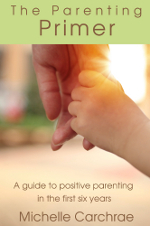 The Gifts of Imperfect Parenting Audio CD can help you begin to answer those questions and work towards being a brave, strong and healthy parent for your kids. 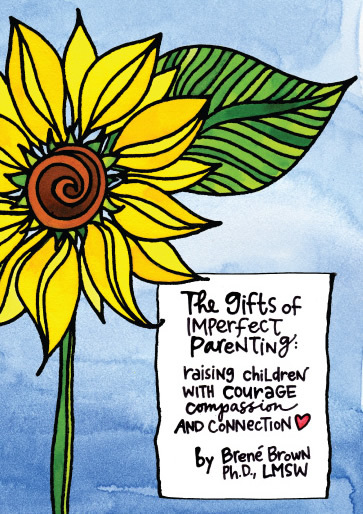 The Gifts of Imperfect Parenting Audio CD is a two-CD recording by Brené Brown, PhD, LMSW, from her lecture series on raising children with courage, compassion and connection. The content of her lectures comes from eight years of graduate studies research on the effect of shame. The CDs are broken down into sections based on the 10 guideposts Brené found during her research. These 10 guideposts are qualities that shame-resistant people share, such as practicing loving kindness, forgiveness, making time for creativity and embracing imperfection. Each week, Brené writes a blog post that relates to one of the tracks on the CDs. Her blog posts expand on the topic covered in her lecture, with the opportunity to respond or get clarification in the comments. Lecture notes and slides are also available on her website. Brené Brown’s research can be summarized into a single statement, which she emphasizes herself in the lectures: “You cannot give your children what you don’t have.” This is the true essence of leading by example and modeling healthy behavior, because you cannot model for your children what you are not able to do yourself. So, by treating yourself with loving kindness, you show your children how to be loving and kind to themselves and others. When you set and enforce boundaries for yourself and your children, you’re showing them how to set and enforce their own boundaries later on. At times, it feels like the work involved in developing the 10 guideposts of shame-resistant people is located in yourself, not in your relationship with your kids. That’s because, well, it is. When you can only teach your children what you have learned yourself, you’ve got to work on learning it yourself first. This approach to building parenting skills feels a bit more like self-psychoanalysis instead of simply solving all your problems by enforcing an earlier bedtime, but the results are far more authentic and connected. It is evident from her lectures and blog posts about The Gifts of Imperfect Parenting that Brené Brown has poured an enormous amount of spiritual, emotional and intellectual energy into the work that brought her to the conclusions she shares in the lectures. With her humility and openness to new understandings and challenges she is teaching us what she has learned herself during her own process, and with openness and humility we too can learn to embrace the challenges and work in ourselves that is involved in raising children with courage, compassion and connection. 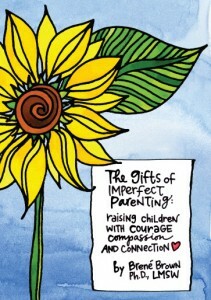 Disclaimer: I received a free copy of The Gifts of Imperfect Parenting to review. Great parenting CD’s thanks for sharing. I’d like to purchase the CD’s. Might you be able to tell me where they are available to buy? The links for the blog don’t work anymore. I’m loving this audio book and would LOVE any kind of worksheet or notes that go with it?? Know where I could find something like that?